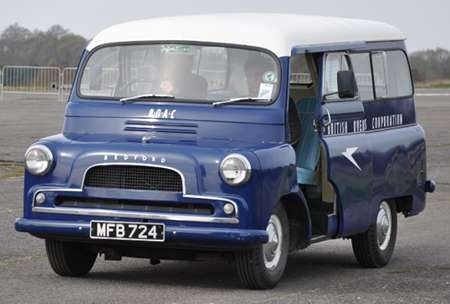 MFB 724 is a Bedford CAL with Martin Walter minibus body, seating 10 passengers. The PSVC listing says she was new to a private owner in 1960 – the registration suggests somewhere in the Bath area – but is now resident at Brooklands, in the BOAC livery we see here. Photographed at Wisley on 11 April 2010.